The pound is going to keep sliding to new historic lows in the coming months and the worst of the British currency’s fall following the UK’s decision to leave the European Union may not be over just yet. Sterling has notched two consecutive days of gains this week, following a massive drop which saw it fall to its lowest level in 31 years on Monday, leading to some commentators to suggest that it may have found a bottom after falling around 12% across two days of trading. However, according to analysis from Pantheon Macroeconomics, it would be the “height of folly to rule out a further short-term decline” in the pound. Pantheon argues that the worst is not yet over for sterling and things are going to get worse before they get better. The research firm’s estimates suggest that sterling could fall to around $1.20 — a level not seen since 1985. “The downward pressure on sterling could build over the coming weeks, as inflows of foreign capital dry up and outflows accelerate. 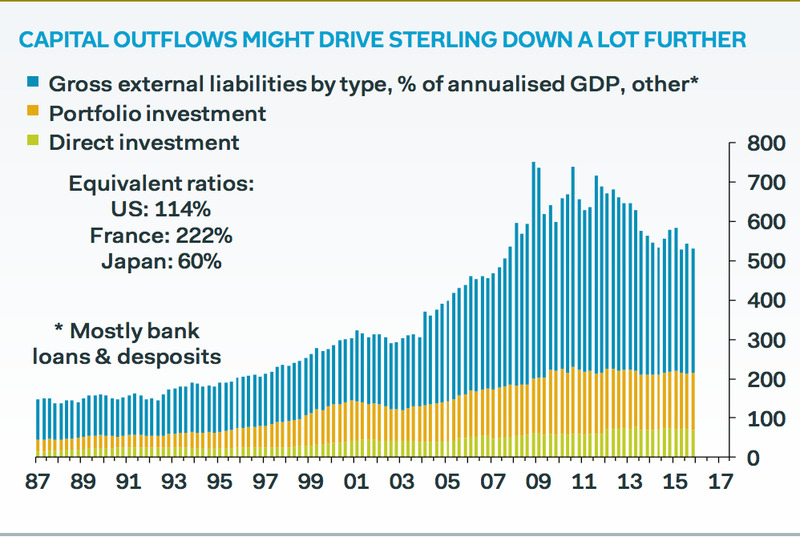 The U.K.’s stock of external liabilities exceeds 500% of GDP, greatly outstripping the ratio in other G7 economies, so the potential for capital outflows is enormous. We do not rule out a decline to the low $1.20s. Essentially, Pantheon argues that the current uncertainty surrounding the UK’s political landscape, as well as how, if, and when Article 50 — the clause in the 2009 Lisbon Treaty that will start the UK’s EU exit process — is triggered, means that people are going to start pulling capital out of the UK, further depressing sterling. Pantheon Macro may be downbeat on the pound’s short-term prospects, but it does expect a reasonable recovery to manifest itself by the end of 2016. “By the end of this year, however, we think that sterling likely will have appreciated to around $1.38. 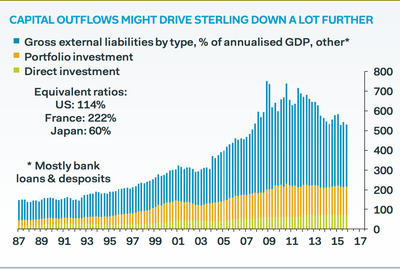 Capital outflows should moderate as the political fog lifts and the next Government negotiates to preserve access to the single market, even at the political cost of maintaining free movement of labour,” Pantheon chief UK economist Samuel Tombs notes. If that prediction does come true, sterling would reach a level last seen in February of this year.